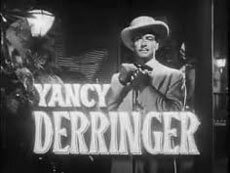 Do You Remember... "Yancy Derringer"
Flush with the success of three seasons of “Range Rider” (‘50-‘53) and several starring films and serials (“Cody of the Pony Express”, “Kangaroo Kid”, “Rough Tough West”, “Overland Pacific”, “Showdown at Abilene”, etc. 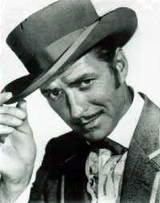 ), Jock Mahoney (1919-1989) signed on with CBS in 1958 as riverboat gambler “Yancy Derringer”, a half hour series was set in New Orleans in 1868 following the Civil War. 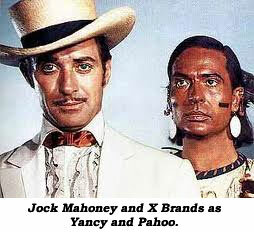 Indian Pahoo-Ka-Ta-Wah (X Brands) who carried a dagger, a sawed-off shotgun and never spoke a word. Incidentally, his name was Pawnee for “Wolf who stands in water.” X and Yancy communicated by sign language, which X said was authentic. Mahoney was fond of the series, “the scripting was a major plus factor in the success of the show. Richard Sale and Mary Loos, the husband and wife writing team, were the inspiration behind the series.” Sale and Loos owned the series together with exec producers Warren Lewis and Don Sharpe. Jocko had a 25% interest. 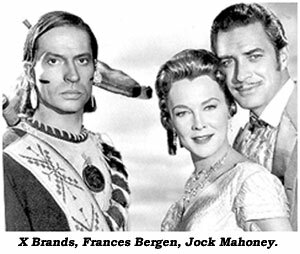 Kathleen Crowley, Peggy Stewart, Jean Willes, Marie Windsor, Virginia Grey, Paula Raymond, Patricia Barry, Kasey Rogers, Noreen Nash, even his wife, Margaret Field—no wonder Jocko hated to see the series end. Unfortunately too soon, after only one season. 34 episodes were made with every intention, buoyed by fine ratings, of a second season. However, sponsors wanted a comedy and an excellent series fell victim to network politics.